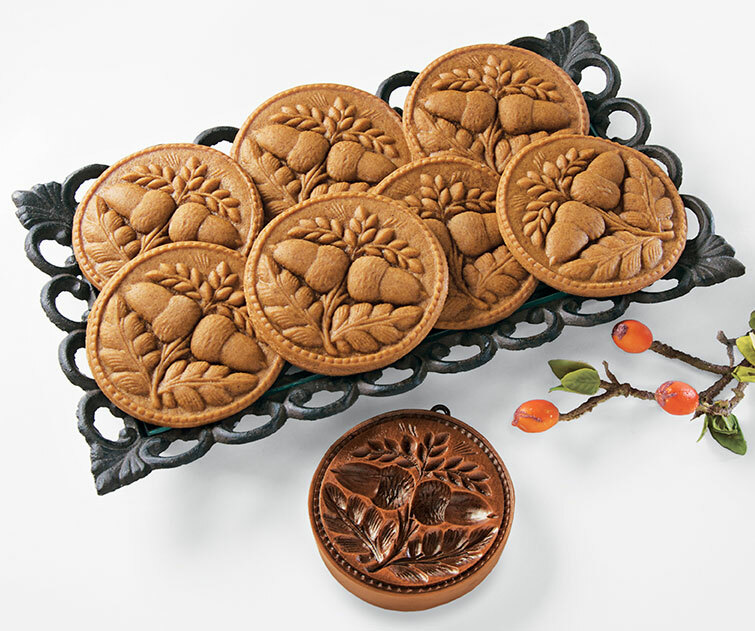 The traditional springerle is a leavened egg, flour and sugar cookie, flavored with anise, and imprinted with a picture from a mold. With origins in Germany around the 14th century, the molds, or “presses”, were either carved from wood or made with clay. Springerle cookies told stories, celebrating births, weddings, holidays, and victories. Method #1: Brush confectioner’s sugar or flour (use flour for cookies and confectioner’s sugar for candy) over mold with a clean, dry pastry brush to prevent sticking. Method #2: In some instances (with House on the Hill Springerle Molds but not with wooden ones), you may prefer to spray the mold with non-stick spray or lightly coat with cooking oil (wiping with a paper towel); for example, to avoid a “floury” look on dark gingerbread. Do not grease and flour molds, as the combination will plug the details. Method #1 – For most cookies roll the dough approximately 3/7″ to 1/2″ thick (deeper molds need thicker dough). 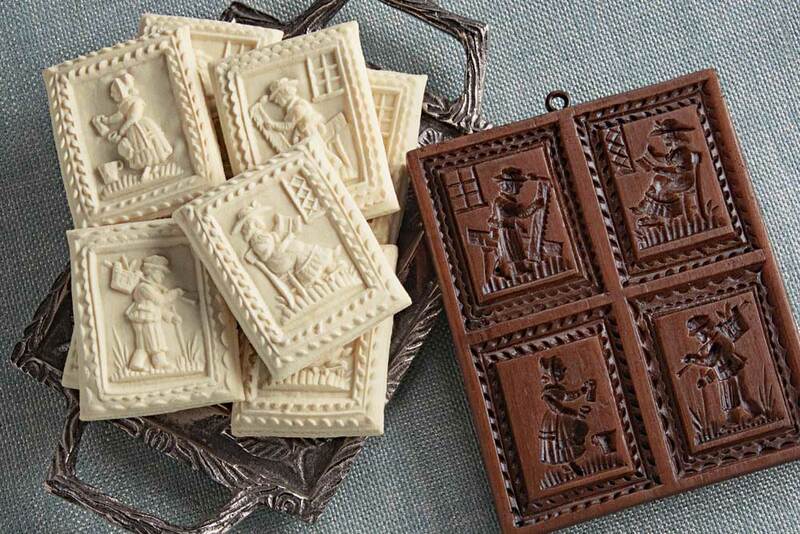 Brush confectioner’s sugar or flour on the mold image, then imprint with your press (mold), cut out shape with knife, pastry wheel, or shaped cutter, dry and bake. If you press a cookie adjacent to another cookie, you may distort the first image, so remember to “press and cut, press and cut” as you go along. Method #2 – For very deep or large cookies roll out dough to desired thickness and, using a dry, clean pastry brush, apply flour or sugar and cut a piece of dough the approximate size needed for the mold. Press dough into the mold with fingers, working from center outward. You may lightly roll the back side of the cookie to smooth before turning out the mold. Trim, dry and bake. To check your print, use light from the side – daylight or light from a floor lamp – so the shadows let you see if your prints are good. Most printed cookies are dried 2-24 hours before baking (depending on your schedule, humidity, etc.). Drying preserves the image during baking. Best bake one cookie of each size first! It saves grief! Baking Temperatures: Ovens vary widely! If your test cookie “over puffs” or tilts, reduce heat, put an empty cookie sheet on bottom oven shelf, or prop the oven door slightly ajar with handle of a wooden spoon to wick off heat. For tiny cookies, you may need the temperature as low as 200°F. In general, the smaller the cookie, the lower the temperature. The larger the cookie the higher the temperature. Bubbles: Flat areas of larger cookies are vulnerable to “bubbles” while baking. Simply press them down manually and finish baking. (Ammonium Carbonate or Baker’s Ammonia) Hartshorn is an old-time leavening unexcelled for cookies and produces an especially light, delicate texture. Hartshorn can be substituted for baking powder proportionately one-to-one in cookie or cracker recipes. Do not use for cake or bread. Hartshorn is not affected by age, but will evaporate so keep it tightly sealed. Dough made with hartshorn stores well, as its leavening action is only triggered by heat, not moisture. There will be an ammonia smell during baking, but it will be baked out of your cookies. Do not eat raw cookie dough made with hartshorn. Flavoring oils are more pure and more intense than extracts or flavorings. They are a super choice for your cookie baking. Don’t be alarmed if anise oil crystallizes or congeals; place the bottle in warm water until it is liquefied and shake. Should your cookies accidentally harden, put slices of apple on firm bread in with them for a day or more. Watch and change apple slices if needed to prevent mildew. Beat eggs until thick. Add sugar gradually, beating well between each addition until all is combined and then beat for about fifteen minutes. This will make for a light finished cookie. Add anise oil and blend. Fold in the flour lightly. Roll out dough about one-half inch thick. Flour Springerle mold or rolling pin (every time before imprinting) and press firmly into dough. Cut cookies along line of imprint. Place on greased cookie sheet. Sprinkle anise seeds of the sheet, if desired, then place cookies on sheet. Let stand overnight in a cool place to dry. In the morning, place in a moderate oven (375°F.) to set the shape, but reduce immediately to a slow 300°F. When done, in 12 to 15 minutes, cookies should be only lightly colored, with the appearance of being iced. You can color details with a brush, if you like, using a bit of food color with water. Keep cookies in a tight can for 2-3 weeks before consumption to develop best taste. To soften, place a cut apple in the can two days before using.